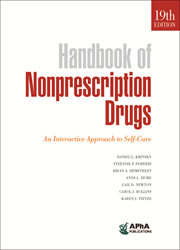 Written and peer reviewed by experts in practice and academia, the 19th edition of the Handbook of Nonprescription Drugs: An Interactive Approach to Self-Care is an authoritative resource for students and for health care providers who counsel and care for patients undertaking self-treatment—nonprescription drugs, nutritional supplements, medical foods, nondrug and preventive measures, and complementary therapies. Written and peer reviewed by experts in practice and academia, the 19th edition of the Handbook of Nonprescription Drugs: An Interactive Approach to Self-Care is an authoritative resource for students and for health care providers who counsel and care for patients undertaking self-treatment—nonprescription drugs, nutritional supplements, medical foods, nondrug and preventive measures, and complementary therapies. Its goal is to develop the knowledge and problem-solving skills needed to assess a patient’s health status and current practice of self-treatment, to determine whether self-care is necessary or appropriate, and, if appropriate, to recommend safe and effective self-care measures.